Three captivating volumes reveal how Einstein viewed both the physical universe and the everyday world in which he lived. A century after his theory of general relativity shook the foundations of the scientific world, Albert Einstein’s name is still synonymous with genius. This collection is an introduction to one of the world’s greatest minds. Nuclear proliferation, Zionism, and the global economy are just a few of the insightful and surprisingly prescient topics scientist Albert Einstein discusses in this volume of collected essays from between 1931 and 1950. With a clear voice and a thoughtful perspective on the effects of science, economics, and politics in daily life, Einstein’s essays provide an intriguing view inside the mind of a genius as he addresses the philosophical challenges presented during the turbulence of the Great Depression, World War II, and the dawn of the Cold War. E=mc2 may be Einstein’s most well-known contribution to modern science. Now, on the one-hundredth anniversary of the theory of general relativity, discover the thought process behind this famous equation. In this collection of his seven most important essays on physics, Einstein guides his reader through the many layers of scientific theory that formed a starting point for his discoveries. By both supporting and refuting the theories and scientific efforts of his predecessors, he reveals the origins and meaning of such significant topics as physics and reality, the fundamentals of theoretical physics, the common language of science, the laws of science and of ethics, and an elementary derivation of the equivalence of mass and energy. 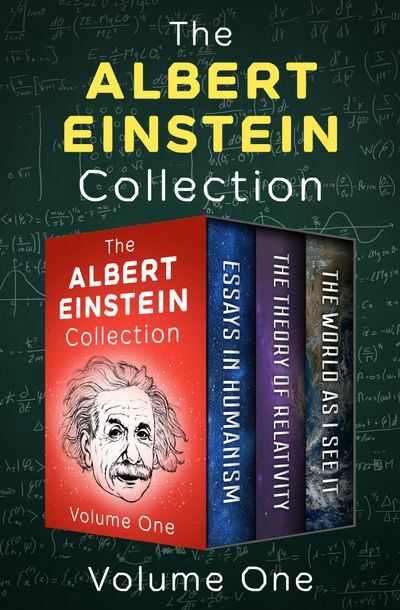 This remarkable collection, authorized by the Albert Einstein archives, allows the non-scientist to understand not only the significance of Einstein’s masterpiece, but also the brilliant mind behind it. Authorized by the Albert Einstein Archives, this is a fascinating collection of observations about life, religion, nationalism, and a host of personal topics that engaged the intellect of one of the world’s greatest minds. In the aftermath of World War I, Einstein writes about his hopes for the League of Nations, his feelings as a German citizen about the growing anti-Semitism and nationalism of his country, and his opinions about the current affairs of his day. In addition to these political perspectives, The World As I See It reveals the idealistic, spiritual, and witty side of this great intellectual as he approaches topics including “Good and Evil,” “Religion and Science,” “Active Pacifism,” “Christianity and Judaism,” and “Minorities.” Including letters, speeches, articles and essays written before 1935, this collection offers a complete portrait of Einstein as a humanitarian and as a human being trying to make sense of the changing world around him. This authorized ebook features new introductions by Neil Berger and an illustrated biography of Albert Einstein, which includes rare photos and never-before-seen documents from the Albert Einstein Archives at the Hebrew University of Jerusalem.